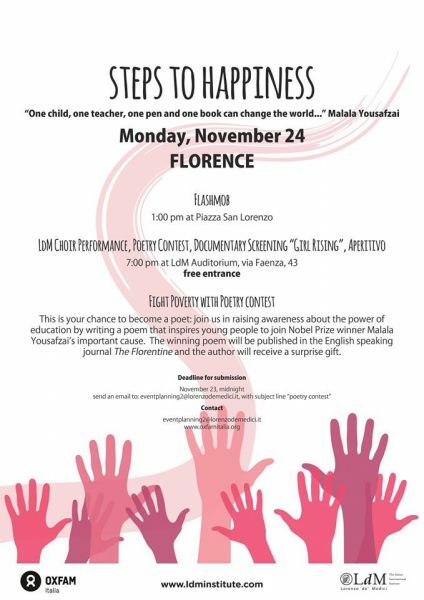 24 Nov 2014 – Steps for Happiness: A Flash Mob & Poetry Contest to fight poverty! LdM’s Event Planning students and OXFAM International team up once again to make a difference. One semester, 17 students, many different ideas and one big, final event: our Fall 2014 Event Planning class is proud to present to you Steps to Happiness! The event, organized in collaboration with Oxfam International, seeks to create awareness of the link between education and the eradication of poverty by supporting Oxfam’s new campaign “Even It Up: Time to End Extreme Inequality”. To make a difference, we invite you all to join our event which will kick off with a “not-just-for-fun” flash mob at 1 pm. In the evening, from 7 pm onwards, we welcome you at the charity ceremony with as major highlights a concert of the LdM choir, the Fight Poverty with Poetry contest and a screening of the groundbreaking documentary Girl Rising. Admission is free, but donations for Oxfam are more than welcome! Fight Poverty with Poetry… how does that work? We call on all creative writers to send in a poem to participate in our contest. Possible themes are: your study abroad experience, a book that changed your life, and why you chose to study your specific degree. Deadline for submitting your poem is Sunday, November 23 at midnight, by sending an email to [email protected] with the subject line “poetry contest”.